Fabrication of the ashpan is in progress. Machining of the crown brasses of the axleboxes continues. The first one has now had the serrations machined into the bearing which will provide a key for the whitemetal. Good progress is also being made with machining the inch and one eighth Whitworth thread of the spring adjustment links, twelve in total. 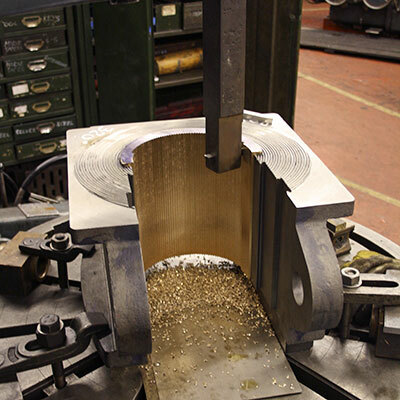 The bearing brackets for the brake shaft are being machined in anticipation of the arrival of the brake shaft from Stephenson Engineering in Manchester. 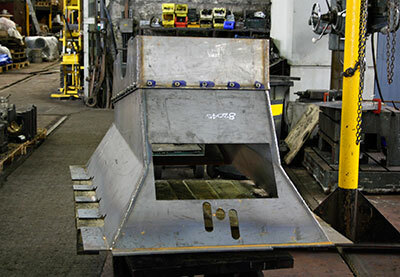 Stephensons are manufacturing the front ring of the smokebox on to which the door makes a metal to metal closure seal. Originally this design of smokebox front ring, which was adopted by the GWR, LMS and BR, was manufactured in the main works by pressing steel plate over the appropriately shaped press blocks but the correct equipment was lost at the end of steam. A door for the smokebox is being manufactured by Beechwood Dished Ends of Pudsey. Painting of the bunker is underway at Boston Lodge Works as these notes are being written. The Standard class 2 Project at the Bluebell Railway have arranged to have the swing links for the suspension arrangement of the rear pony truck manufactured in sufficient quantity to cover their needs and ours also for which we are extremely grateful. Readers of the magazine Steam Days will know that the latest issue (March 2015) includes a superb feature article by Trust member Alan Clothier, in which he endorses the 82045 project and talks of his days in the Swindon Works Design Office in the early years of BR and of his affection for the 82XXX class on which he worked. We are delighted with the article and would like to thank Editor Rex Kennedy and his team for the splendid job they made of it. The magazine also included the "Never Again" appeal leaflet, so fingers crossed for a good response from readers. Do read the article if you haven't already seen it - it is a fascinating account of the class from a perspective denied to the rest of us. The programme for publicity from now to New Year 2016 has been decided, and the objective is to have a fresh impetus approximately every three months. Chris has been in touch with Adrian Knowles, Editor of the GWS house magazine Great Western Echo, and will be providing an article about 82045 for the August issue, in which we will also take out advertising space. Adrian is enthusiastic about the project: while not a GWR loco, the 82XXX is about as near as you can get to one given the class's provenance, and can certainly be regarded as Swindon's last fling with steam. We also plan to do something with one of the mainstream mags - discussions have already been held - and would like to kick off 2016 with an article in SVR News. By then, 82045 should be quite an eye-catcher, so we hope for a good response. The boiler appeal has now passed £150,000, and the aim is to reach £200,000 by the end of this year. We are going all-out to gather funds for this item, while at the same time ensuring that the money is always there for all other aspects of the accelerating build. Orders are now going out thick and fast for diverse components of the engine, so prudent forward planning is essential: the Trust has never been in debt and is taking great pains to ensure that this remains the case. Once 82045 is running, the plan is to keep a maintenance fund active so that, when overhauls and repairs need to be paid for, the money will be available to pay for them. Steaming fees and hire-out fees from other steam lines will form the basis of this, and we hope that some members will continue to support the loco with a modest monthly standing order after it enters service. After all this, the last thing anyone wants is for 82045 to be sidelined while it awaits a place in the overhaul queue, so we are determined not to be saddled with debts at the outset of its career. Thanks are due to member Martin Beaumont of West Yorkshire, who has sponsored the smokebox door following the appeal in last month's updates. Tony has placed the orders for the door, door plate and distance piece for the dart (which we already have) that locks and unlocks the smokebox door. This still leaves the smokebox barrel itself - known as the "wrapper" - awaiting possible sponsorship, so if anyone would like to claim all or part of this highly visible item for himself/herself, please get in touch with Chris. Estimated cost is between £4,000 and £5,000. Glistening black - at least until the inevitable grime of service dulls its sheen - the smokebox will form a stunning contrast with the engine's lined dark green livery when it enters service. With work under way as outlined above, we are hopeful that 82045 will soon have its "face", initially pointing determinedly towards Salop: a nice bit of potential publicity there for those on the SVR who would like to see the line extended northwards, though of course that is way beyond our own remit! Don't forget that this is on Saturday 11th April at 14.00 in the upstairs Lecture Theatre at Kidderminster Railway Museum. The date was fixed before we knew that it fell during Members' and Shareholders' Weekend, but hopefully that might actually prove advantageous. All are welcome, as are constructive suggestions, so please do come along. 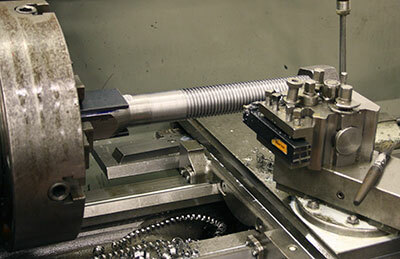 The axlebox crown serration machining in progress. Photo: Tony Massau. Screw cutting the threads on a spring adjustment link. Photo: Tony Massau. 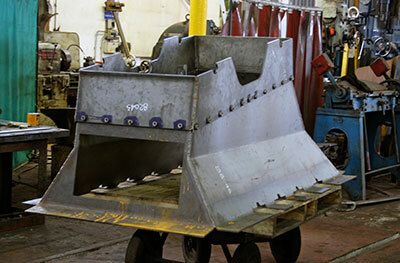 Two photos of the ashpan fabrication - with the ashpan upside down. Photos: Tony Massau.